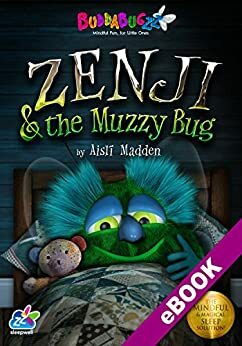 “Zenji & the Muzzy Bug” is the ultimate ‘feel-good’ bedtime story, for kids of all ages. Enriched with mindfulness, “Zenji & the Muzzy Bug” helps children become relaxed and sleepy at bedtime. Characters Zenji and Karma teach us how to feel better physically and mentally, by being mindful and focusing our thoughts. They encourage readers to listen to their inner voice, believe in their inner strength, and be mindful of their hero within. Zenji the Buddabug is feeling rather unwell. He is stuck in bed and he’s extremely bored… That’s until his buddy Karma appears and takes him on a magical adventure… inside Zenji’s body! After listening to Karma’s relaxation rhyme, Zenji is transported inside his own body where he heals himself from within, and becomes more relaxed with each breath he takes. Buddabugzz bedtime stories are infused with well-being and mindfulness techniques that help develop self-confidence and positive thinking from the earliest age. Each title is purposely designed to encourage sleep at bedtime and to safeguard and nurture children’s mental health from infancy. Scientific evidence indicates that mindfulness has incalculable physical and mental health benefits. It is also used all over the world as a remedy for insomnia. In my mind Mindfulness is also the cornerstone to happiness. I wanted to introduce children to mindfulness and help get them to sleep in the process! I wanted my characters to be appealing and tangible to kids, so I designed them that way. Although they are fictional, their 3D quality gives them a realistic appearance! Every Buddabug has a personal friend and guardian called Karma, who helps them to overcome day to day obstacles. Karma is a reflection of each Buddabug character and is very similar in appearance. Karma however, is much smaller, surrounded by glowing light and has a superhero “K” on its chest. This encourages young readers to believe in, and be mindful of their own inner strength, and their hero within. Then exhale all the yucky ones that make you feel sad.